It’s hard to believe we are already coming back around to Christmas again, as 2016 has raced past us. I’ve come up with a few things for my wish list – likely things you may also enjoy having in your shop (or garage, or little closet…) Let me also wish each and everyone a safe and happy holiday season! 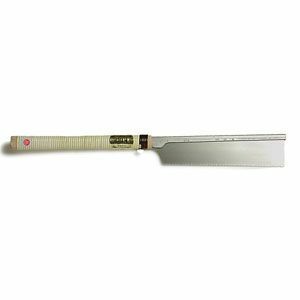 Ikedame Dozuki Saw – As many will already know, I was shown Japanese hand tools at a very early age, and I regularly use this type of saw. This is a very fine saw, with a blade thickness of .012” and a kerf of .018”. This saw is sharpened to excel at crosscutting wood, and will leave a beautiful surface. As with all saws, remember to let the weight of the saw do the work, and you will find it both fast cutting and easy to control. If you apply extra force, even with the stiffened back spine, you will likely fight against it diving off of the intended line. Hock #80 Scraper Blade – 2-¾” HC – While there are other blades available for the #80 Scraper, and some work just fine, this Hock blade will hold its edge for much longer. I also tend to use this blade without a Scraper Body, and I’ve always preferred to use a thicker scraper blade when hand held. When I work with figured maple and Claro walnut, there are times when a super sharp scraper is called for, and most of the time I keep the burr to a minimum, if I apply one at all. If you need to convince yourself, take a freshly sharpened chisel, hold it vertical (cutting edge down, and the bevel facing yourself), and then lean the handle away from you by about 15-degrees. Hold the chisel down near the bevel, and with a light touch on the wood, move it away from yourself. You may find you need to angle the handle further away, or slightly less, but you should find it does a great job when working a very focused area. Whichever way you decide to use this blade, I’m sure you will be very satisfied. 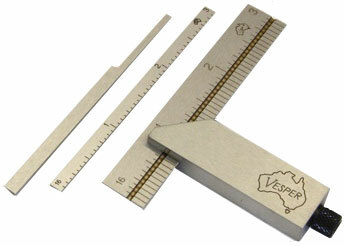 Vesper Double Square Set – I have a few different squares, and some are quite nice, but there is something special about Vesper’s squares. I believe this has to do with the personal attention to a product, versus large companies with large staffs. Besides the quality and accuracy, the varying blade sizes and the shape of the head are all contributing factors. These provide the widest range of flexibility that I’ve seen, and when I make some of my hand-cut dovetails, the narrow blade is such a valuable tool, whether they are through dovetails or blind.